Drost Landscape existed long before its founding in 1991—if only as a handful of potential logo drawings on the dining room table of founder and owner, Bob Drost. From the time Drost began working as a landscape laborer in the late 1970s, he knew he wanted to start his own company. He waited until he had more than a decade of experience to make the move. “I thought it was important to learn and watch because there was so much to figure out,” he says. 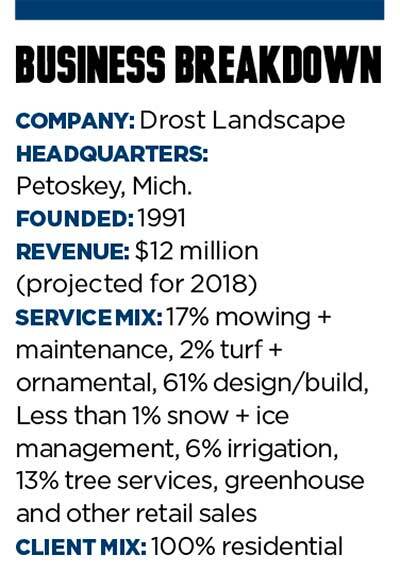 Now with 39 years of industry experience under his belt, Drost leads the Petoskey, Mich., company, which employs more than 110 people, boasted $9.6 million in 2017 annual revenue and has projected $12 million for 2018. 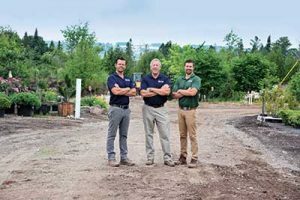 Founded by Drost and his partner at the time, Tom Gleason, Drost Landscape started out with a mere four employees. Gleason approached Drost with the idea of going into the business together after Drost, still working for his previous employer, performed landscaping work at Gleason’s house. A partnership was formed. After 14 years of what Drost calls “unbelievable growth,” Gleason retired, and Drost purchased the remainder of company in 2005. Shortly after becoming the company’s sole owner, Drost says he needed help running the business, which was doing about $5 million in revenue. He solicited help from one of his employees at the time, Dale Drier—who had been employed by Drost Landscape since May 1997. To date, Drier has 25 years of green industry experience, 21 of them working for Drost Landscape. While Drost says he sees himself as the visionary and salesperson, he credits Drier for the behind-the-scenes work that keeps the company afloat—a responsibility that previously fell on Gleason. Drier manages nearly everything that deals with finance and production, such as profit sharing, insurance matters and 401(k) plans. He also acts as a direct report for project managers. Drost and Drier managed running the business for several years, but the acquisition of Willcome Tree Service in 2014 expanded the company by 25 percent, saddling the two with a bigger operation than they could handle. “We were at a crossroads in our organization and needed a turning point,” Drier says. In 2014, Drost Landscape enlisted the help of business coach, Jeffrey Scott. 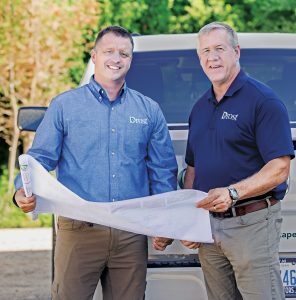 Drost adds that he—along with several other Drost Landscape team members—was reluctant about calling in a business coach at first. “People don’t want somebody to come in and tell them how to change some things,” he says. However, Drost says pairing with a business coach helped make 2014 a decisive moment for the company—in part because it was during the initial consulting meetings that Drost officially named Drier as the general manager. Previously, Drier had held roles including laborer, foreman, soft-scape supervisor and project manager. Throughout the first few sessions, Drost and Drier prioritized specific needs of the company and laid out expectations. For example, the two agreed upon a dollar amount that Drier can spend without consulting Drost. Drost says this helps keep the business moving along. Then, within the past year, the two created a written understanding: Drost and Drier individually filled out forms detailing their responsibilities before combining the documents into an official agreement. In the meantime, Drost and Drier meet once a week or more for at least 30 minutes to keep one another in the loop. They also attend peer group meetings to stay accountable and to discuss challenges and opportunities with other landscapers. In addition to defining the roles of owner and general manager, the consultations led Drost Landscape to implement project manager positions. The company now employs five project managers, many of whom are college graduates. Under each project manager are foremen and laborers. “I use the term that they ‘own the job,’” Drost says, adding that he was formerly responsible for many of the tasks the project managers now handle. Now, once a job is sold, the project managers help bid the job, meet with the client on-site, work with the billing department to ensure accounts are accurate and field any calls or questions from that client. “We’re trying to blend the process so that it meets more of a construction model as opposed to the homeowner having to talk to seven different people about a project,” Drier says. Each project manager then reports directly to Drier, who sets up “coaching” meetings, where he reviews achievements, goals and objectives for that employee. “We want to get away from handing out what we think is adequate pay and leave it more in the employee’s hands to achieve those goals,” Drier says. Keeping with the coaching format, Drost Landscape has also developed a career training plan, detailing what’s expected of each position. Items can include technical skillsets, such as trailer setup, irrigation and light installations and equipment operation. After the initial training period, the training format turns into a coaching setup, complete with tools such as the “10-minute checkup” review. During the 10-minute checkup, the employee meets with his supervisor to talk about one thing he’s doing well, and one thing on which he can improve. Drost says the goal of these reviews is to generate meaningful conversation, as well as two key takeaways. Drost Landscape also promotes employees and distributes pay increases based on an employee’s initiative to attain additional education and certification, such as nursery, hardscape and general green industry professional certifications. Additionally, the company pays for the employees’ classes, including continued irrigation classes, brick paving classes and more. Drost Landscape also encourages its employees to take advantage of the Certified Green Industry Professional pretest course, offered by the Michigan Nursery & Landscape Association during its winter convention. “I’ve never turned anybody away who’s asked to go to classes and have it paid for,” Drier says. In the past, Drier says creating a positive company culture has proved to be a challenge for Drost Landscape. The company tries to curate a family-like atmosphere with initiatives that include companywide activities, continuing education opportunities and profit sharing. All-company events include holiday parties, employee field day, family-fun picnics and decorating floats for local parades. Profit sharing is worked into the company’s benefit package, and employees are assured a certain portion of Drost Landscape’s profits, depending on their position and time with the company. Another challenge the company must contend with is the unpredictable weather that often racks northern Michigan. For example, this past year, much of Drost Landscape’s nursery stock was destroyed by bitter cold temperatures that hit unexpectedly in April. To keep busy in the winter, Drost Landscape performs shoreline restoration projects on the frozen lakes, works on designs and equipment repair and does snow removal. 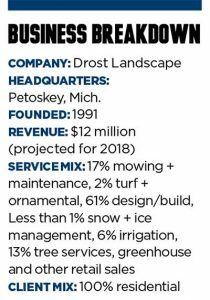 Drost Landscape added snow removal to its portfolio about five years ago with one truck but has since expand-ed that segment to five trucks and a few loaders. The company then kicks off its spring season in April, with planting, maintenance and irrigation projects. By 2020, Drier says he would like to see Drost Landscape grow to $12.5 million. The company’s long-term goal is $20 million by 2027. Despite the lofty goal, the team remains confident. To hit the revenue goal, Drost says he wants to tap into other segments of the market, such as excavation opportunities. Drier adds that further acquisitions are also a possibility, especially since several other companies have already contacted Drost to ask if Drost Landscape would buy out their companies. For future acquisitions, Drier says he will analyze more closely the potential acquisition’s overhead recovery, gross profit margin and year-over-year budgets. “If all that info comes back and the culture is similar (to ours), then we will move on the acquisitions,” he says. He’s also considered monetary incentives for existing staff members to stay on during the transition period. The incentives would be paid out at the one-year anniversary of the acquisition. For the time being, Drier says the company will focus on continuously improving itself. Both of Bob Drost’s sons, Travis Drost and Dustin Drost, have a hand in the family business. Bob Drost’s firstborn son, Travis Drost, works as a salesperson and as a project manager. Bob Drost says Travis Drost grew up unsure about whether he wanted to be part of the company, but after a year away, he came back to Drost Landscape, starting on a maintenance crew and working his way up. “Travis loves to meet people and walk them through the designs,” Bob Drost says. Dustin Drost, on the other hand, always had a calling to be in the business, according to his father. A craftsman who’s won several awards in Michigan for pools and hot tubs he’s built, Dustin Drost serves as a project manager for Drost Landscape and deals mostly with the hardscape side of the company.